On Monday, I had a great conversation with Shiri Spear of FOX 25 News about my new book, The Princess Problem. I was glad to answer her questions about my book and to share a few tips on raising empowered girls, as well. A link to the FOX News video and a transcript are below. Enjoy! SHIRI: From the movies they love to the fairy tales they read, a little girl’s love affair with princesses has been going on since, well—since once upon a time, a very long time ago, in a land far, far away. But some wonder if we are creating a little bit of a princess problem, so we’ve got Rebecca Hains here. She’s a professor at Salem State and also author of the new book The Princess Problem: Guiding Our Girls Through the Princess-Obsessed Years. So glad you’re here today because I am living this right now. It’s pink and purple, it’s up to my eyeballs in sparkles. I think there’s some good, there’s some bad. So I cannot wait to hear what your expertise has to say about the whole thing. But first, lay out: what exactly is the princess problem we’re creating? REBECCA: Well, it’s this way that princess has become so unavoidable in little girls’ lives, and when girls are encountering all these princess toys and movies, they’re also encountering really difficult race stereotypes, gender stereotypes, a beauty ideal that nobody can live up to, and ideas about female behavior that are really retrograde—like that you should be passive and sweet, and maybe not as strong and empowered as we want our modern girls to be today. SHIRI: No, it is true. I see my girls put on the outfits with their shoes and stuff, and they sit and they daintily drink tea. That’s how they mimic being a princess. Do you think that the princesses are becoming a little tougher? Are they improving a little bit from where they were in maybe the Sleeping Beauty and Cinderella days to where they are now with Merida in Brave and Rapunzel? I mean, is it getting any better? SHIRI: I love her! She’s my favorite. REBECCA: She’s terrific! Rapunzel could actually do things, and she used her hair in an active way—it wasn’t just, “I’m sitting brushing my hair.” And the sisters from Frozen are definitely progress over their predecessors. Where the problem comes in is the way that all of the toys go back to the sort of Cinderella/Sleeping Beauty type, and it’s all about the dresses and not about the things that they do. SHIRI: Oh, it really is. I remember seeing some archery stuff for Merida, and that was the most active that those toys got. Most of them were the tea party costumes that you would go and put on. SHIRI: What are we supposed to do as parents, though? You talk about a “pop culture coach” as a parent. What is that? REBECCA: Well, I think that every parent can take matters into their own hands and be their child’s pop culture coach—helping them to think critically about what they see on the screen and what’s in the toys that they have in their home. In so doing, you can watch TV with your kids and ask them questions. Talk back to the screen. Say, “You know, I really don’t like it when she does that,” or “Isn’t that great how she takes care of that for herself?” so that they know what your values are. I think that’s the most important thing: Watching and talking with your kid, and communicating that your values are not necessarily identical to princess culture. SHIRI: So it’s going to require us to kind of sit and watch with our kids, instead of turning on the movies, instead of turning on maybe the Disney Channel and just letting them do a free-for-all, it means sitting and watching and kind of exposing ourselves to what our kids are involved in. REBECCA: Right, and not just watching, but also talking—because the studies show that when parents sit and watch and don’t talk back, the kids might think they agree [with what’s on screen]. SHIRI: Okay. Now, what are some of the long-term consequences of some of these appearance-driven roles that girls are seeing with the princesses? What are some of the long-term consequences that could come out of this princess fever? REBECCA: You know, what really happens is that girls who get really into princess culture, and love dressing up as a princess, and get used to people complimenting them and saying, “Oh, you’re so pretty”—they get hooked on external feedback about their appearance. So where do they have to go in early adolescence and the teenage years? You know, it’s really about, “How do I dress to get positive feedback,” or any feedback–which may not be the direction you want your daughter going. SHIRI: And I actually want to bring this up: One of the more interesting parts of the book, I thought, was when you actually talked about dads’ role in all of this. So, we’re not just talking to moms out there listening, but we’re talking to dads, as well. And you had some interesting things to say about how dads even just making comments in passing about women in general, and the princesses, and how it could all be contributing to this appearance-driven phenomenon. REBECCA: Right. Dads are really girls’ role models for what to expect in romantic relationships later on, not the princes in the Disney films. And when a dad, you know, looks at pictures of women on billboards around him, if he can just not comment on their appearance? That actually kind of helps, because then girls won’t think that it’s normal for guys to be fixated on appearance, when women are valued for so much more than their looks. And also, talking to daughters—for both moms and dads—about their interests, their activities, their passions, and not just their appearance really teaches girls that we value them for who they are, and not how they look. SHIRI: Ok, so note to my husband, if he’s listening right now—you can’t talk about having the hots for Jasmine any more! Can’t talk about that! Anyhow, Rebecca, thank you so much for being here today—some really great stuff. I actually really enjoyed the book. I think it’s totally applicable to where we are right now with our girls. And again, the book is The Princess Problem: Guiding Our Girls Through the Princess-Obsessed Years. I thought this was a great interview but I had to read the transcript, the link for the video didn’t work. 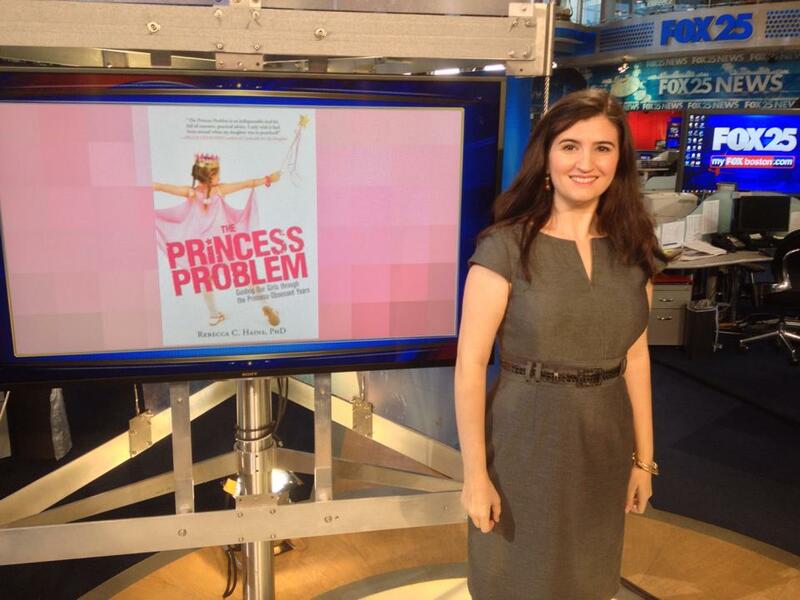 Watch Dr. Rebecca Hains discuss her book, The Princess Problem on Fox 25. LOVE this! You’re so on-point. I have been thankful a thousand times over for being called “smart” instead of “pretty”. I know girls that grew up with external feedback, and – as adults – I see traces of it in how they view themselves, in their self-awareness, and in their relationships. Thank you! I appreciate that. It’s so easy to forget that the formative years are truly formative, even though if we squint, we really can see it (as in the example you offer of girls who grew up with external feedback). I’m so glad I stumbled upon your blog. I am definitely going to go get your book now. Oh, thank you–I appreciate that! I hope you enjoy it.